Pregnancy. Unless you are an adult film star, never in your life will your body belong to so many people other than yourself. Doctors, midwives, family, friends, co-workers, cashiers in the check- out line at the grocery store, your hairdresser, that woman on the subway….everyone will have an opinion or a piece of advice. You will spend more time naked, with your legs in the air then you ever thought possible, and every single bowel movement, burp, outbreak of acne and passing of gas will be up for discussion and on display. After all, it isn’t your body anymore. The second you announced you were growing another person, everyone around you suddenly bought stocks in the investment that is a baby. I have been blessed enough to have four healthy pregnancies and each one of them was an amazing miracle from start to finish. But every one of those pregnancies was a bit different. And even miracles can be ridden with anxiety and a little messy. Growing a person is mind blowing, and the pressure we put on ourselves while pregnant to make sure we give our baby the best and healthiest start in life is enormous. So guess what world? We are already worried enough for everyone, so unless you are handing out donuts with that advice, or we actually asked to hear it, kindly back off. 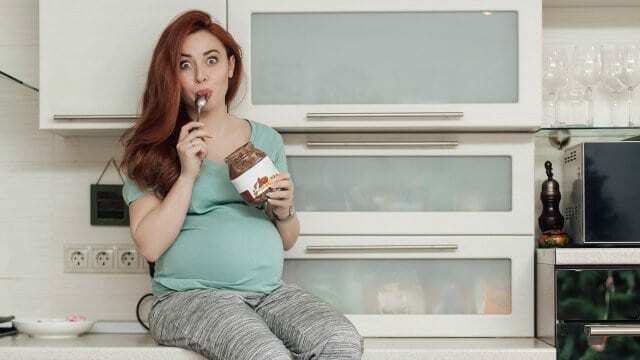 Having been pregnant four times, I have compiled a little dos and don’ts list for the world surrounding pregnant women, both in and out of the delivery room. It’s time we reclaim our bodies….at least a little bit. Don’t ask her when she is due. If she wants you to know she will tell you. Out of four pregnancies, three of mine went more than ten days past my “due date”. I am usually a very mild mannered mama, but by day five I was not a woman to be messed with. In fact, I am pretty sure that the poor girl in the drive through at Tim Horton’s that made the mistake of asking when I was due may still be off on stress leave. Trust me, she is more obsessed with her due date than anyone, and once that date has come and gone the last thing in the world she wants is to constantly explain that to strangers. And, unless she is your best friend from birth or you are her doctor, do not ask about her mucus plug….I mean seriously. Do not EVER guess how far along she is in the pregnancy. This is the equivalent of that game where the creepy guy at the carnival guesses your age. Every pregnancy is different, every woman is different and everyone gains and carries their baby weight differently. Asking this question almost always leads to responses such as, “Oh wow, you are still so small.” This response leads to the poor woman immediately worrying that she is somehow starving her baby. Or, my personal favorite, “Really? You are already so big! Wow. That must be a big baby.” Why? What on earth makes anyone say those things to a pregnant woman? First of all, you are making her paranoid at a time when she really shouldn’t be thinking about weight, and second of all, and most importantly, are YOU pushing that baby you just called huge out of your lady parts in a few short months? No? Well then shut the hell up. Please don’t touch her. This single act reminds pregnant ladies again and again that their bodies became time share properties the second they started to show. Unless she invites you to feel those amazing, miraculous kicks, hands off. She is spending far too much time being groped by doctors inside and out, has an actual person taking up real estate in her womb and even her partner hasn’t been allowed to touch her in weeks, so why complete strangers feel that what she really wants is a good belly rub is beyond me. Pregnant bellies are an invite only event. Do Not Underestimate Food Cravings. This may actually save the lives of a few partners out there, so pay attention. If a pregnant woman is craving something, that and ONLY THAT thing will do. Do not ever, ever substitute, regardless of how closely related you may feel the two items are. If your spouse asks you to pick up an apple pie from her favorite bakery on your way home from work, it means she really, really wants apple pie. If, for some reason you feel inspired to instead purchase a gluten free, sugar free, mini apple pie, don’t go home. Just keep on driving….a life on the run will be far easier than what is waiting for you at home when you present her with that sorry excuse for a craving substitution. Don’t tell her how busy she is going to be. This is one for those moms that already have a little one, or more at home and usually have them in tow while waddling through town running errands. I got this one all the time. “Oh wow, you sure are going to have your hands full.” Really? I hadn’t thought of that. Aren’t babies usually born with nannies and maids as part of a package? Don’t you just select the self-feeding, self-changing and self-washing babies when you are growing them in the womb? Isn’t there a button for that? Oh, and thanks for mentioning that this next child will suddenly make me “busy”, because right now I spend all my time lounging on the couch in my pajamas eating chips, so good to know that my life will suddenly change. We know we will be busy!!! We are already busy!!! So, unless you are going to join us while we run errands and keep one of those other children from running off or knocking over a store mannequin please respond with “what a beautiful family you have.” Because that is what we are actually trying to accomplish. Don’t tell her she’s glowing unless she actually is. Pregnancy is different for everyone. With one of my pregnancies I had beautiful, glowing skin and gorgeous hair. I felt beautiful. With the others I had acne, pregnancy mask, dull hair and gas. I hated it when people gushed that I was glowing. I knew it was a load of crap and they just didn’t know what else to say. Becoming pregnant doesn’t mean that we suddenly remove all mirrors from our homes. We know if we are “glowing” or not. Just tell her she looks healthy, or better yet, don’t mention her appearance at all. Just ask her what she’s craving…. Do not tell her stories about terrifying deliveries. What is wrong with people? The moment a woman announces her pregnancy everyone from her sister in law to her dry cleaner feel the need to traumatize her with horror stories from the delivery room. Stop it! She is already obsessed with having a healthy baby and a smooth delivery. Why add to that worry with stories about your neighbor’s cousin’s hairdresser who was in labor for three days with a fifteen pound baby that was born sideways? Instead, talk about that magical moment when your baby was placed on your chest for the first time. Or the sound of your baby’s first cry. Keep it positive people. Do not mention her pooping on the delivery table. I cannot stress enough how important this is. It may be the most important point of all. After nine or more months of weight gain, morning sickness, heartburn, hair growth, hair loss, acne, gas and loss of bladder control, if you feel the need to ever, ever mention that she lost control of her bowels while giving birth, you are on your own. You will likely be sleeping on the couch indefinitely, and that couch will likely be in the garage. Some things simply do not ever need to be spoken of. This, is one of those things. Above all else, remember she is growing another human being. Nod and smile, be ready with snacks, and unless you are directly asked a question, just keep your thoughts and ideas to yourself. Especially remember number #10. This post originally appeared on Is It Chocolate or Poop?